This year  has marked the 60th anniversary of the liberation of France from the Nazis and their puppet government, which was headquartered at the town of Vichy. One fact that’s not often celebrated is that the first allied soldiers to enter Paris and drive to the Hôtel de Ville were a tank company, comprised of 120 Spanish Anarchists who had wound up, together as a unit, in the army of Maréchal Philippe Leclerc*. Before examining the proud and special case of these comrades, let me touch upon how Paris remembers that day; what the day means elsewhere in France; why it was so important that the fascist regime was crushed. It’s not so easy to say who was more intensely hated by the French People in the final days of the occupation: the Germans or the Vichy police. Neither were loved, but the French fascists and those who collaborated with them were hated more intimately, for more personal reasons. I have only recently become European, having moved house less than a year ago. I’m a newcomer, and before that I was a history-obsessed tourist who dropped in now and then. What can I share about this year of memory, especially just this past August 25th, when Paris was decked out with the national colors, and actors drove along the grand boulevards in period uniforms and old military vehicles? Let’s start early in the morning, when I leave my suburban apartment, on my way to work in the city. At the other end of my street, before I even reach the bus stop, there is a stone plaque on the front of an ordinary two-story house. It reads, “Raymond Langlois was born here on June 30, 1922. Arrested for resistance on October 13, 1940, he died for France while in deportation, on December 15, 1943, at Auschwitz.” In other words, three months into the fascist period, 18-year old Raymond acted against the regime in some way that is probably not known to anyone on my street, and so they took him away, they used him as a slave for three years, and then they murdered him. I walk another ten minutes to the train station at Noisy-le-Sec. As with just about every station in France, there is a plaque on it, bearing the names of the railroad workers, based at that particular station, who were shot for sabotaging train lines, helping Jews get out of the country, killing nazis, or for some other good deed during the war. But Noisy-le-Sec has an unusual sadness that is memorialized in the cemetery alongside the station. On the night of April 18, 1944, allied bombers had the job of destroying Noisy’s important “marshalling yard.” This happens to be a spot along the region’s railway system where there are branches going off in various directions, as well as car and equipment storage areas, all of which were vital to the fascist operations. The bombers, from the USA and Canada, not only destroyed the railroad operations, but three-quarters of the town’s buildings as well. There were 420 civilian deaths in that one night of friendly-fire bombardment. The ten-minute ride into the city is a boring one, especially for those who have already done it. I like to take a slightly different walk from the station to work each day so as to know the city better as the weeks go by, and of course to break the monotony. Near where I get off the regional train line is Gare de l’Est (The East Train Station). It has a designated area inside, where large stone plaques tell travelers a few basics about the Nazi-Vichy period in France. One slab lists the names of 70 men and 8 women who worked at that station and who died resisting the fascists. Another slab, which can be missed by a passer-by only with difficulty, states that between 1942 and 1944, more than 70,000 Jews (of which 11,000 were children), were deported from France to Nazi death camps. All of them were sorted out and documented, then sent to the camps from certain suburban train yards, including Drancy and Bobigny. The shame of those towns revisits me whenever I pass through them, which is fairly often because they’re near my home, along a trolley line that takes me to the home of certain good friends. There’s a special fact regarding Drancy, telling of the difference between the hatred of foreign soldiers and the more intimate hatred of murderers who speak one’s own language. It was the sorting-yard that handled the largest number of doomed deportees during the war. How many German soldiers were garrisoned at Drancy, making certain that all French Jews and all enemies of the Reich were efficiently ushered to their deaths? There was one: some lieutenant with a desk job. To the memory of the students of this school who were deported between 1942 and 1944 because they were Jewish-born. They were exterminated in the death camps, innocent victims of the Nazi barbarism and the Vichy government. More than 500 of these children lived in the 10th arrondissement. For some reason, even though I have passed this school dozens of times, even though I’ve shown it to visitors and read the plaque to them, I have until today thought that it was a high school. There are posters and various other signs on the building, and I’ve never spent more than a minute or so in front of it, which is located in a tight niche, in a fairly busy spot. Today, I noticed the soot-covered words, Ecole Elementaire. I turned to a lady, about 30, who was waiting near me by the entrance, and asked her a question in my lousy, but steadily improving French. “This is an elementary school? The kids who were deported were little, like this?” I held my hand out, waist-high. “Yes, that’s correct,” she replied. “What are the ages of the school’s students?” I asked her. “Six years to ten years old,” she told me. The door opened and a little girl rushed out to the lady, who took her daughter’s hand and walked away. She turned momentarily and said goodbye to me. Her little girl was just the way I had put the question: waist-high. By the way, there are 20 arrondissements (districts) in Paris. A wonderful thing about being an anarchist is that when one travels to another country, there’s a whole new set of anarchist stories to learn. The one I’ll share now is familiar to all well-versed French anarchists, and in the August 2004 issue of Le Monde Diplomatique, a radical monthly, the tale of the 9th Armored Company at Paris was included in a fine article by Denis Fernandez Recatala. As the Second World War got underway, there were Spanish anti-fascist partisans all over France, often the best and bravest people in the resistance. The way this developed, in part, was that at the end of the Spanish Civil War in 1939, refugees of the defeated Republican-side armies, including anarchists, were detained in camps along the Mediterranean beaches near Perpignan, not far from the Spanish border. Each morning, gendarmes would march through the barracks, urging the Spaniards to join the French Foreign Legion. Thousands accepted the offer, from every political faction of the former Republicans. The Foreign Legion was spread all over the French Empire, and in July 1940, each general, in whatever part of the Legion he commanded, decided for himself whether he was with the Vichy government or with the Allies. The legionnaires in North Africa went Vichy, while those in Chad and the Cameroon, under the command of Maréchal Leclerc, sided with the Allies. Anarchists had been dispatched to both these areas. Those under Leclerc continued the fight against Hitler and Mussolini from the beginning, often viewing it as a prelude to their return to Spain and the eventual defeat of General Franco. It is said that even the few anarchists who survived through the war in Algeria under the Vichy command rejoined their comrades in Leclerc’s celebrated 2nd Armored Division in time for the complex and brutal task of liberating the capital from the enemy. Leclerc gave a special assignment to his 9th Armored Company, which was entirely composed of Spanish anarchists, under the command of Captain Raymond Dronne. Because this particular unit was the best in his army for fighting in towns, house by house, street by street, Leclerc had the Spaniards enter the capital first. At 8:41 p.m. on August 24, 1944, a tank with the name Guadalajara* painted across it entered Paris through the port d’Italie, at the southern end of the city. Their goal was to reach the Hôtel de Ville as quickly as possible, because that key building had already been taken by members of the resistance five days earlier, and they had been fending off assaults by the Germans. The 9th Company was not slow. At 9:22 p.m., 120 Spanish anarchist soldiers arrived, driving 22 vehicles (tanks and half-tracks) painted with names such as Ebro, Teruel, Brunete, and Madrid, after battles of the Spanish War. One of the armored vehicles bore the name Don Quijote*. Another was called Durruti*. This last, of course, honored the legendary anarchist leader who, upon learning of the uprising of the fascist generals in July 1936, quickly transformed labor union organizations into militia units, raided armories for weapons, and drove straight into battle against the fascists. [URL=/tags/buenaventura-durruti] Buenaventura Durruti [/URL] died during the battle of Madrid four months later. The 9th Company parked themselves in the square in front of the Hôtel de Ville and were greeted not only by the defenders of the building, but by the public as well. Their first tactic was to install a cannon inside the building in case the Germans attacked again, and this was nicknamed abuelo (grandpa). The cheering crowds gathered around them, asking if they were Americans, but then were surprised to hear them speaking Spanish. 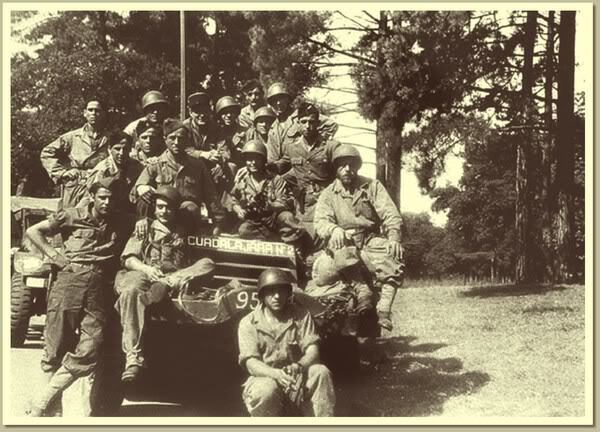 Members of the General Council of the Resistance, who were among the defenders and very glad for the reinforcements, warmly greeted Lieutenant Amado Granell. The remainder of Leclerc’s 2nd Armored Division entered Paris during the morning hours of August 25th. By 4 o’clock p.m. on that day, General Dietrich von Choltitz, the German Governor of Paris, signed a document surrendering Paris in front of Leclerc, and thus the city was liberated, at least formally. General Choltitz had been captured two hours earlier by a Spanish soldier named Antonio Gonzalez. During the next few days there were fierce battles all over Paris, and it is estimated that about 500 of the allied troops were Spaniards (including the anarchists of the 9th Company). Some of the worst spilled blood in places that are most familiar to tourists, such as place St. Michel, place de l’Etoile, place de la République, and la Concorde. One critical fight was at the Hôtel Majestic, headquarters of the Gestapo. Let the reader remember that “Gestapo” is the German acronym for “secret state police” which was part of the Nazi SS, and its entire purpose on this Earth was to complete the mission of the Nazi party. It was not something that pre-dated Hitler’s movement, nor did it have a regular peacetime existence in the German constitution. Dozens of the Spaniards fell dead during those same days, and very possibly there were Spanish anarchists, having lost their own land to Franco’s thugs, but who gathered their few surviving selves together again and went into the Majestic, slaughtering the last Gestapo rats in Paris or losing their lives in the attempt. They didn’t need to know the details from l’Ecole Belzunce, one of the places where Gestapo personnel had rounded up six and eight-year olds by the thousands and then murdered them because they were Jewish. The Spanish anarchists already knew what fascists are made of, and when it was “show time” at the Hôtel Majestic, they knew exactly what to do. August 25, in Paris, is a day of celebration, every year. However, war is many things, but it’s never a simple thing. On that same day, August 25, 1944, a small village located a few hours south of Paris by train was surrounded by German SS troops. The soldiers went to every house, shooting to death everyone they saw and burning down every house. Some of the 124 victims were in their nineties. Others were not yet one. This year, on the day of mourning, the people of Maillé opened a very small museum and solemnly visited their cemetery, where a massive granite stone, full of names, dominates the tiny place. A documentary film was made about the “martyred village of the Touraine.” Most French people have never heard of the place. But memory of the war is noticeably different in that area. The nearby city, Tours, had many of its street names changed by the Vichy regime. The names have never been changed back. The building that was Gestapo headquarters, a place of much death and torture, has no plaque on it. In Paris, the war is remembered everywhere. In Tours, it’s almost as though it never happened. Maréchal Leclerc’s army, with its anarchist 9th Company, continued its offensive straight into Germany. Along the way, the Spaniards helped liberate Strasbourg, and they were present when the allies took Berchtesgaden, Hitler’s headquarters in the Bavarian Alps. By the time the war ended, there were only a handful of the 9th Company anarchists left alive. Leclerc : Captain Philippe François Hauteclocque took the cover name François Leclerc (to protect his family in france from reprisals) when he joined the Free French. Guadalajara was actually a half-track ; Don Quijote was actually known in a mixture of French and Spanish as Don Quichotte. The soldiers of the 9th Company were not allowed to use names of political figures. The halftrack which would have been called Durruti was actually named Los Pinguinos. Good little read. Thanks for posting. The French also agreed/were told to remove black soldiers who had been fighting since 1941 from Leclerc's army as the American Army which was segregated and insisted that blacks could not be in tank units (one managed to keep his place). Otherwise there would also have been Senegalese troops in those tanks. Sadly a lot of those anarchists were under the impression that once the fascist dictators in Italy and Germany (and France depending on how you view the collaboration regime) had been dealt with they would then go on to the fascist dictator in Spain. It's good to see this again. I remember Albert Meltzer telling me about this episode when I was in London in 1975. The Christie Books publication mentioned above is a great read and well worth seeking out a copy. Kudos to Kate Sharpley. "All of us Spaniards in the battalion were different, with different political leanings, but we were all united by a shared hatred of the Germans, a craving for freedom and the firm belief that the Allies would help us liberate Spain. The French knew how to put that hatred to good use." (p203-4 of "La Nueve", testimony of Manuel Fernández (Belmonte)). Her book (being the story of a unit) doesn't really go into the details of how "liberation" was reduced to "military defeat of Germany". that's great, do you know who the people in the picture are, or if they were anarchists? 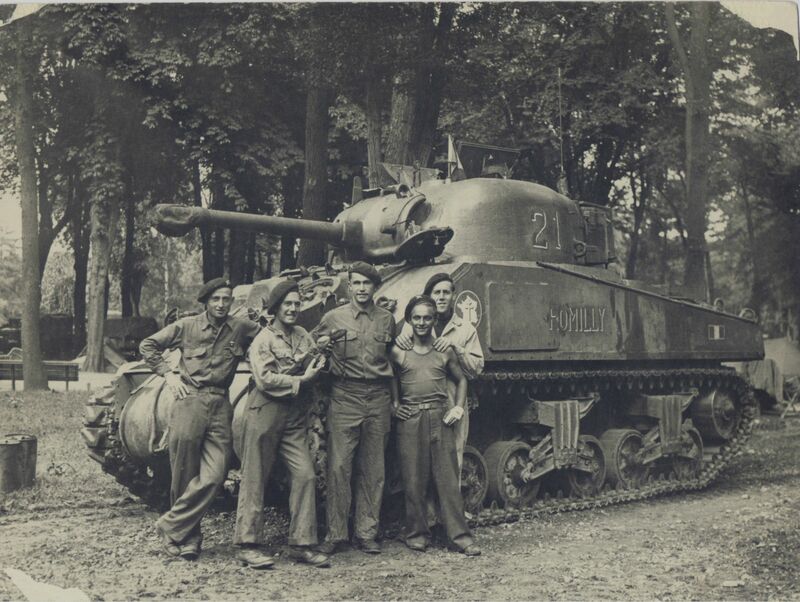 French soldiers of the 1st Platoon, 2nd Armored Division (French: 2e Division Blindée) pose with their tank Romilly in Bois de Boulogne park in Paris following the city’s liberation. Pictured are (left to right): François Jaouen, Roland Hoerdt, André Peseux, François Collon and Pierre Coatpehen. "Black WW2 heroes deliberately removed from the unit that liberated Paris. Then a general strike in 1945-46 and railway strike in '47-'48.